Well, ether does make you forget everything, until it wears off. Lincoln » November 27th, 2017, 8:44 am wrote: Ether doesn't exist. Stop reading articles from over 100 years ago. It's like you posting on the politics of the Romanov court. I will of course confirm all of that 100%. There may be some things that physicists don't all agree about. But this isn't one of them. Well.... I should make some small modification... When teaching a lot of mathematics, Euclidean space is pretty much assumed as as a basis for doing that mathematics. But if the teacher claims that this is what the universe is really like then they are overstepping their bounds. It is a good approximation for many types of calculations in physics also. But no physicist thinks the large scale structure of the universe is Euclidean. And of course ether has gone the way of phlogiston into the conceptual garbage can. Lincoln said - "Ether doesn't exist. Stop reading articles from over 100 years ago. It's like you posting on the politics of the Romanov court. There are no schools researching ether and Euclidean, because we've known that it is dead, wrong, and utterly forgettable for over 100 years." I thank you both, and apologise for my apparent stupidity, but it still leaves me with a problem. My thinking is probably a logarithmic level behind yours in this field, so maybe I need someone at just a linear level above my thinking to respond to this post. Hopefully someone with an understanding just a smidge above mine will consider this post and be able to respond at my level. When I fly as a passenger in a jet plane, I’m aware that at 30,000 feet, the air is rarefied and that the interior of the plane is pressurised. My understanding is that outside of the plane at that height, there are less molecules of the components of ‘air’ per Euclidean cubic metre than there are at sea level. Then my question is “What is the nature of the ‘substance’, ‘medium’, ‘nothingness’, ‘ether’, ‘space-time’ (malleable or not) between those molecules of ‘air’, and even within the atoms in those molecules." AT THE AEROPLANE FLIGHT LEVEL, RAREFACTION OF AIR CAN ONLY BE EXPLAINED IN TERMS OF EUCLIDEAN GEOMETRY AND VOLUMES OF THIS APPARENT ‘NOTHINGNESS’. And if the plane were a space craft, the Euclidean volumes of this ‘nothingness’ relative to the numbers of vibrating energy foci within it, would progressively increase until the craft began to reach other ‘bodies’ with massive densities of such foci within a given Euclldean volume. What am I missing when I read that this ‘nothingness’ does have at least one property – malleability? It is capable of bending or warping, but how can ‘nothingness’ have a property? Does a ‘Theory of Everything’ preclude studies of this 'nothingness' and even the space that we humans occupy? I’ll get a joke in ahead of Braininvat for my last question. Is it the ‘nothingness’ between the vibrating energy foci in the atoms in my brain that make me sound so empty-headed at times? It is simply empty space. A room can have people in it or not. Put more or fewer people in the room and the room has the same amount of space. The fact that molecules have space between them isn't all that unusual. There is empty space between Earth and Jupiter. But there ain't no ether. What is your favorite hypothesis for the origin of neutrino mass? I have none. Could be Higgs. Could be seesaw. Could be door #3. Both that article and the author are quite insightful. Lincoln » Mon Nov 27, 2017 6:46 pm wrote: It is simply empty space. A room can have people in it or not. Put more or fewer people in the room and the room has the same amount of space. Forget about the word ‘ether’ please, and let’s regard this post as being about what Lincoln refers to as ‘Empty Space’. I have to admit that I’ve taken very little interest in particle physics, but as a fence sitter on the subject, I’ve found it curious that the ‘nothingness’ that represents almost the total volume of ourselves and our universe has received so little attention. My query about whether this empty space was being researched was not answered so I searched a bit more. The following video tape suggests that some people may have been studying ‘empty space’ in recent years. Could anyone please check this 2013 video and confirm whether this theory has been debunked or whether it is a hoax. If, indeed, this process is going on constantly in the ubiquitous 'empty space', it becomes difficult to regard 'empty space' as inert. If you have evidence debunking the video, could you please supply references supporting your evidence. That video is 100% true. But it is also well known. The Sci Am article is indeed interesting. Substructure might provide an explanation for the troubles we have been having with string theory. For me, that would be the most attractive reason for the idea of substructure. In particular, how preon theories impact the question of super-symmetry will be something I will be keeping my eye on. Well, the generational nature of matter has to be explained and when we've seen this in the past, it has been a signature of substructure. Superstrings are a compact solution, but it beggars the imagination (at least mine) that there is no new physics in the next 15 orders of magnitude of energy. Lincoln » Thu Nov 30, 2017 12:42 pm wrote: That video is 100% true. But it is also well known. Thank you for that Lincoln, but it was hard work finding out that your "simply empty space" was not 'empty space', but a very busy 'thingy' in one sense. I don't quite know what you mean by that, but that's OK. However, getting back to the subject, space is full of quantum fields. This has been known since the 1940s and experimentally demonstrated many times. Anyone who talks as if they discovered that space is complicated is not saying anything insightful. They're just saying that they are 75 years out of date on their science education. It's clearly not news. Any interpretation of this picture? Zet posted a citizen scientist web site to help sort through and tag images and this is the most interesting one I came across. I don't know, but is it possible it is a star getting devoured by a black hole? I don't expect a black hole is really black. It sure looks like the brighter star material is being pulled towards the white cloud, as would all local dusts and material and matter, all a waiting a turn to fall into the event horizon? It is RA: 213.95266 DEC: -1.85225 if that means anything to anyone? I'd like to know where in the sky to look? Without context, there is no way to know. But if it were a black hole, there would be copious x-ray emission. This is a trivial thing to check with the right equipment. This is some of the information I was able to find on my own, but it is not copying in the same format. Much of it is undefined. I haven't heard back from anyone, so maybe next week? Or it just may not be anything. I'll just keep poking around and try and figure the site out, use the dash board etc. I certainly wouldn't jump to the black hole conclusion. There is not even much evidence that these are in proximity let alone that one is losing matter to the other. 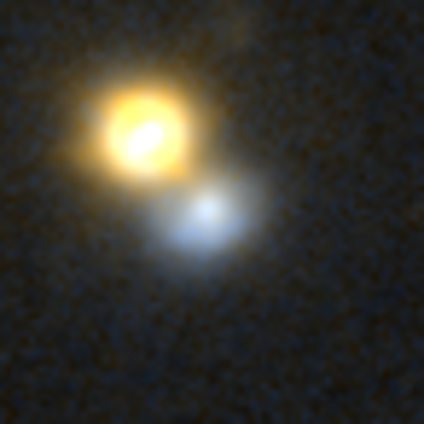 But if they are in proximity to one another then my first guess would be that the smaller one is a white dwarf, because it is so much less bright despite being higher on the spectrum, which indicates a considerably smaller size (luminosity goes up with the fourth power of the temperature and only the square of the radius). But I think it is more likely that the hotter blue-white star is much farther away. But if it is a white dwarf in proximity then it is possible for it to draw matter off the colder star, though that would mean it could eventually reignite and produce a supernova. Yes that seems to be the case. It is just a coincidental positioning of a much more distant galaxy, according to the message I just got. O well. The other reason you know that is unless it is extremely close to us, there is no way it will resolve two stars in that close proximity. Just think for a moment about whether even the Hubble would resolve two stars that are close enough to have one start siphoning mass off the other one. Lincoln, I Loved your course, "The Theory of Everything" and apparently so did many others. A score of 4.7 out of 5 (on 61 reviews) is quite good at The Great Courses. As expected, it was particularly strong on particle theory. I look forward to viewing it again soon. I'm no fan of ether but those who seek the simplicity of a Euclidean perspective can easily be accommodated. Minkowski spacetime is considered hyperbolic, as indicated by the minus sign in the interval equation (e.g. d² = r² – t², where d is an interval, r is a spatial span [or "radius"], t is elapsed time and universal speed limit c = 1 is implicit). The existence of a speed limit implies that space and time are not truly independent coordinates since, by its own definition, translation through space can not occur independent of translation through time. Rearranging the equation however (to r² = d² + t²), eliminates the minus sign and suggests interval-time coordinates as a Euclidean alternative. I'm not abandoning Minkowski spacetime, merely adding interval-time coordinates for their invaluable perspective. Physics is replete with coordinate systems, each advantageous in a particular situation. Interval-time coordinates are the only ones which correctly depict a lightlike interval. By contrast, Minkowski spacetime grossly misrepresents this so badly, that most physicists still exhibit no grasp of the concept. For example, referring to a lightcone diagram in Minkowski spacetime coordinates, Feynman calls this interval a "separation", when that is anything but the case. Pole Vault: A lightlike interval in a Minkowski diagram and the pole on a flat map similarly distort their actual extents. While the equator is 24,000 miles long, neither the south pole nor a lightlike interval have any length at all, contrary to these common representations. Closing In on Reality: Interval-time reveals that, as spatial and temporal separation become equal (regardless of size), interval separation disappears. Is debit a payment option? Watson wrote: Is debit a payment option? Can't say I now what you refer to. I might have missed it. Minkowski space overrides Euclidean space. Always. ...because we've known that it is dead, wrong, and utterly forgettable for over 100 years. I was wondering if the course could be paid for using debt? I thought you might know, having bought the program. Or someone else may know. I suspect not. First one of my own: "now" should be "know" in "Can't say I now what you refer to." above. It's rare that I get a post the way I really want it. By the way, I purchased Don's "The Theory of Everything" direct from The Great Courses, using credit card ($60 on sale). But the reason for this is to acknowledge a new course just released by one of Don's colleagues (Dan Hooper) at Fermilab. In 12 lessons he reviews "What Einstein Got Wrong" in the context of all he got right. I expect we've covered most of these in this forum already but it will be interesting to have a thorough, systematic review. On sale at $30 (US) its cheaper than many popsci books. I'll view my first lesson tonight. *It's not my intention to advertise here. I make these recommendations from direct experience (I own 104 courses) in the same way anyone might recommend a valued book. It is also the specific topic of the forum & thread. Amusingly, I setup Dan and The Great Courses first date.